Al Habtoor Motors, the leading brand in UAE’s automotive sector as the official dealer for some of the world’s most coveted international brands, has launched the first JAC Motors showroom at Airport Road, Port Saeed, Deira. JAC’s state-of-the-art showroom features the world renowned Chinese automaker’s line-up of passenger and commercial vehicles and is the first of its kind in terms of corporate brand identity. Set in the bustling locale, the JAC showroom has the look and feel of a premium luxury brand and will definitely impress the UAE residents. 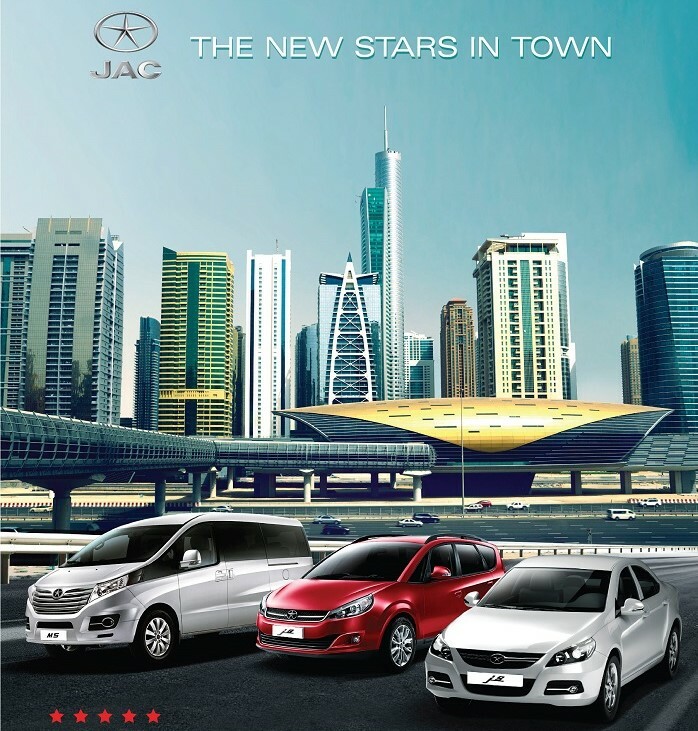 The JAC showroom launch has come at a favorable time when JAC Motors is celebrating its 50th anniversary from its launch in 1964. The new showroom features the J5 and J6 sedans, the M5 MPV, the Sunray van and mini bus and lastly the light and heavy commercial vehicles of various payload capacities. Elegant and dynamic, the new JAC J4 is the perfect combination of fashion and class. The all new JAC J4 is equipped with a 1.5L four cylinder turbo charged engine which generates 113HP with CVT transmission. JAC J5 is jointly designed by Italy Pinfarina Design Company and top designers and experts from JAC domestic and overseas companies. Its design style reflects the perfect integration of international auto design trends and fashion. The car was honored as ‘The Most Beautiful Car Model of Pinifarina for Last 10 Years’ and was awarded 5-Star Crash Test Rating Under C-NCAP. The J6 is fashionable, high tech and energy-saving on the basis of quality enhancement and improvements that have been made in shape, interior, function and configuration. Its sportive design ensures a low wind drag coefficient resulting in less fuel consumption. Its 1.8L engine perfectly balances dynamic and economical efficiency. The high-end M5 MPV offers large space and great freedom to move. High-quality leather material has been used for the seats. The M5 is equipped with a three-screen DVD audio-visual system, eight-direction adjustable seats, electrical-sunroof, visual parking sensor, BOSCH 8.1 edition ABS and EBD and 360 degrees swerving mid row seats that provide versatile seating arrangement. The Sunray is a van and minibus that was first released in late 2010. The exterior of Sunray was designed by JAC’s R&D centre in Turin, Italy, while its team in Tokyo, Japan, was responsible for styling the interior, with engineering and testing carried out in Hefei, Anhui, where the company is headquartered. The sunray bus is equipped with reclining seat backs giving it the touch of luxury while the van version comes with massive 12 cubic meters cargo capacity. JAC light commercial vehicles are available in the range of 3.5 and 4.2 tons and the heavy weight commercial vehicles are available in 8.6 and 12 tons. Both vehicle segments come with turbocharged diesel engines providing heavy duty performance, air conditioning, power steering and radio with CD player and much more. All JAC passenger vehicles will be offered with 150,000 kms or 5 years warranty.